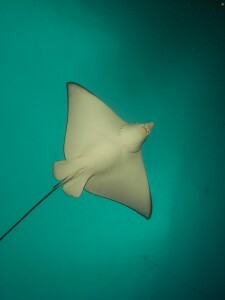 Swimming with spotted eagle rays would be one of the more enjoyable experiences related to spearfishing and freediving. Down south we do not get the numbers of manta rays that are experienced up in and around the great barrier reef, so for NSW spotted the eagle ray will have to do. The only bad thing about swimming with these rays is that they tend to congregate around pinnacles and in areas where currents first hit islands.